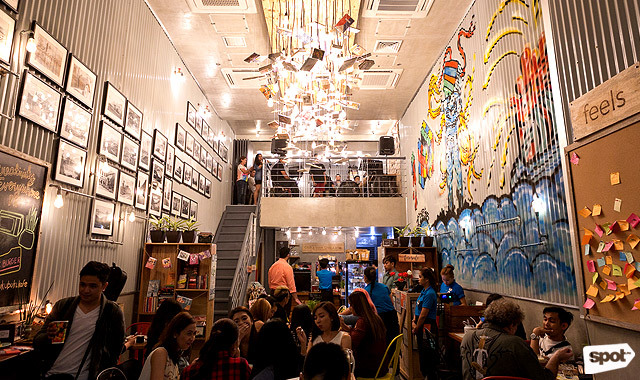 Where bookworms and art-lovers unite! (SPOT.ph) Buku-Buku Kafe has just launched its second branch at SM Southmall, which is quite a giant step for the mother-daughter-son trio (Lyn, Jessica and Nicolas Santiago) who run the multi-hyphenated place that serves as a reading space, a coffee shop, and full-range dining hub. 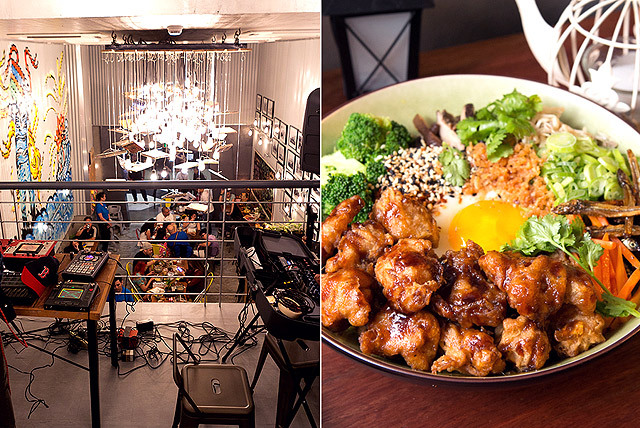 But actually, even the head of the family participated in conceptualizing the café. Jessica explains, "We wanted the name to reflect the food; but another, more important, reason was because we wanted to include our dad in [the] story. He was the one who gave us this name, and, being in Malaysia for a couple of years now, he would best know the kind of food and flavors we'd like to share in Buku-Buku." A lot of cafés excel in one aspect yet fall disappointingly short at another. 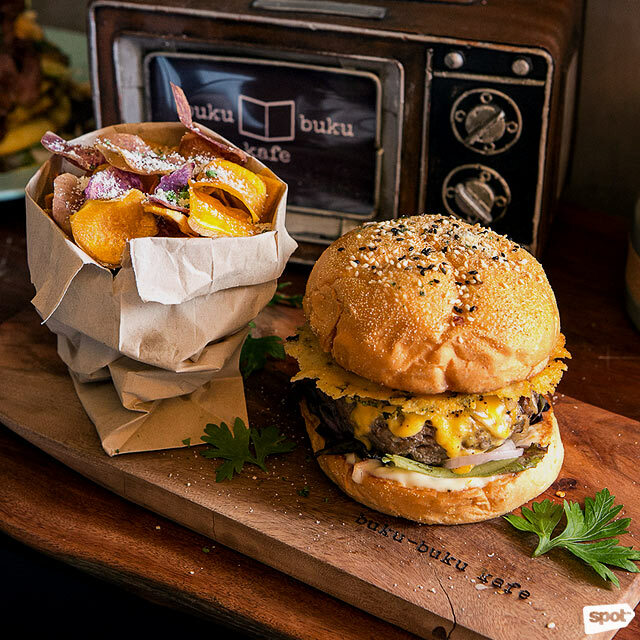 But Buku-Buku Kafe stands tall and proud in all their facets, be it taste or presentation, ambiance or service. "Buku Buku,” which means "many books" in Bahasa, invites you to be open to new ideas, conversations, and most of all, to open a book or two. When you step inside, it feels as though Alice has grabbed you to hop with her straight into the rabbit hole. Their first branch at Imus, Cavite was a good springboard for wilder imaginations to come. 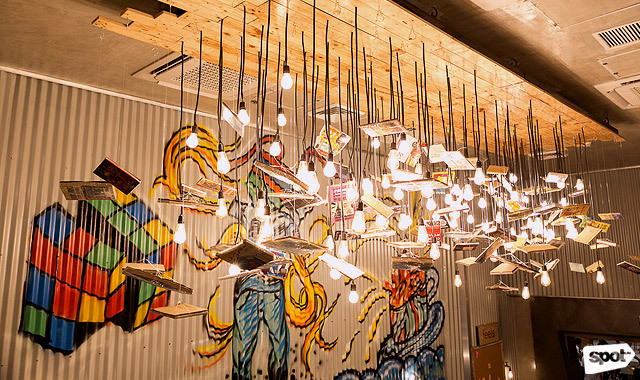 For instance, the highlight of the first branch are the hanging books on the ceiling. 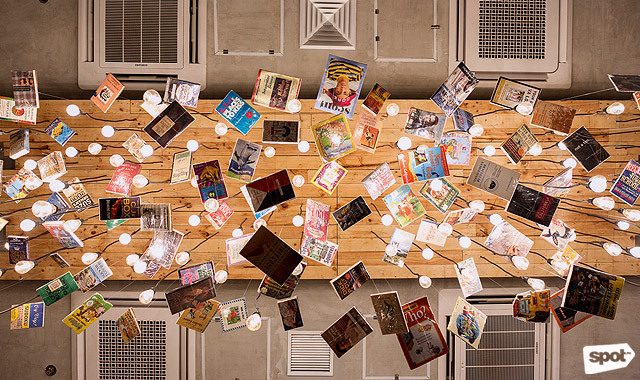 At the new branch, they take this concept on a grander scale by forming a whimsical book chandelier created by the alternating combination of 100 light-bulb fixtures and the owners’ books. 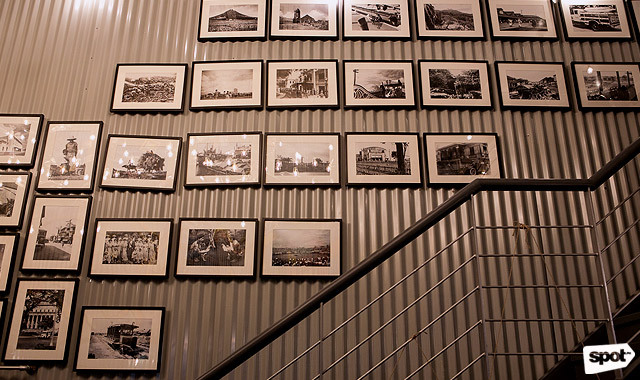 On the left side, your attention will be caught by a myriad of framed black and white vintage photos hanging just above the staircase. It strikes a sense of nostalgia showing images of Old Manila as well as the Oblation statue from Jessica’s alma mater, UP Diliman. Right across these images is a loud and vibrant street-art commissioned mural by artist Jeffrey Ramir Mateo. 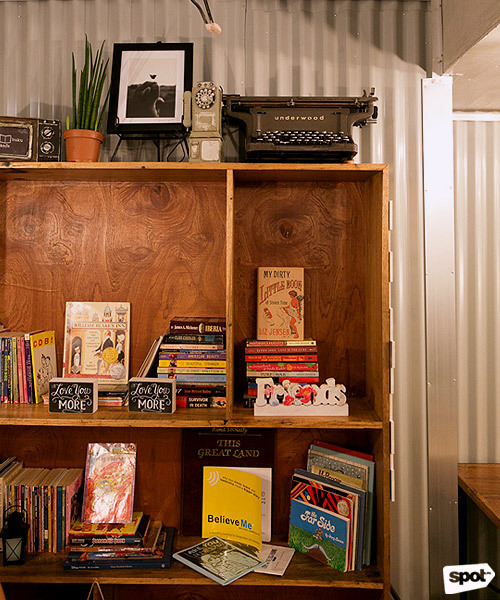 Should you wish to ascend higher or seek more information, literally and figuratively, all you have to do is climb up to the mezzanine where there’s a cozy nook where you can dine and read (at the same time) from the owners’ personal collection. Illuminating the mezzanine space are light pieces made by Lyn Santiago. Repurposed metal pipes are cleverly pieced to form robot lamps and dangling light bulb men with arms and legs made from excess royal cord electrical wiring. But the industrial chic vibe doesn’t make you feel cold at all because the food and drinks warm you up starting with the Triple Cooked Chicken Wings (P225), a fun platter for sharing with friends. 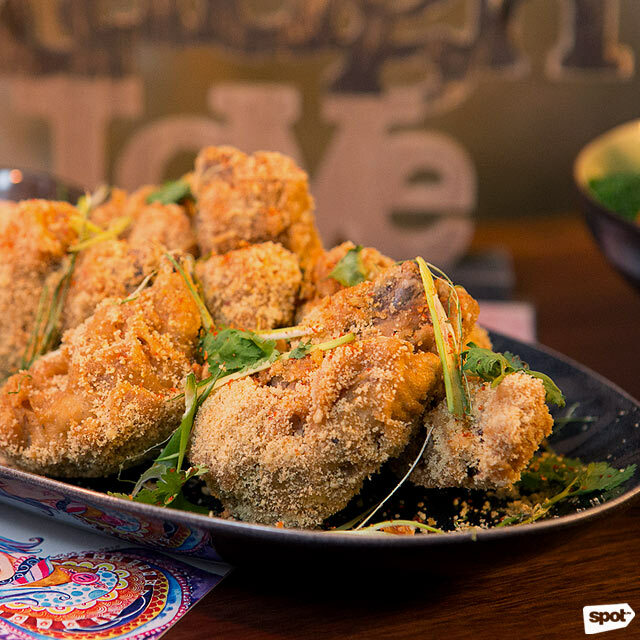 The chicken wings are blanched, baked, and deep fried served with garlic parmesan sriracha aioli. 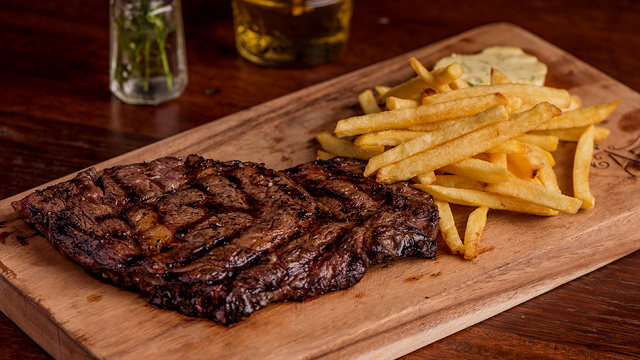 The crunchy skin gives a nice contrast to the tender meat, while the tasty aioli dip emphasizes the taste of the chicken. Together with the appetizer, the Barako Mocha (P125) may be a good way to heat up the palate for more feasts to come. Made with barako coffee, the rich mocha flavor is derived from a local tablea. If you're feeling “hangry,” the Bük Burger (P355) is just the kind of order you can solo. Bite on chargrilled premium beef patty, sharp cheddar, and parmesan crisp, smoky tomato ketchup, Spam cuts, lemon aioli, and kamote chips. 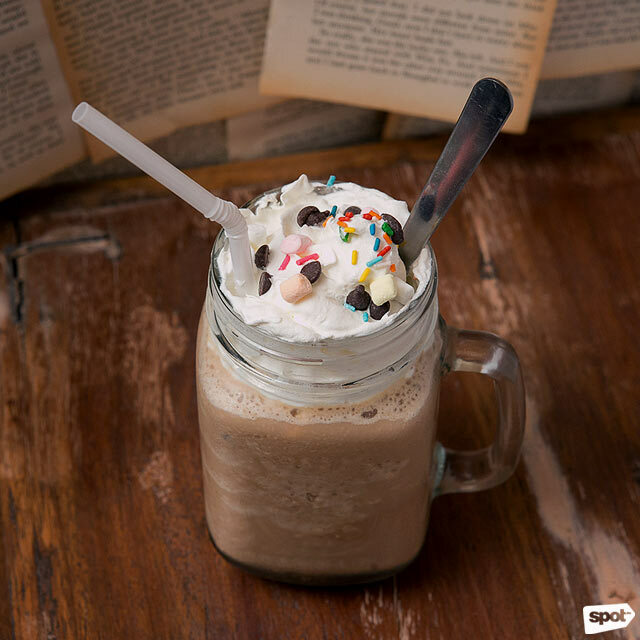 The explosion of textures and tastes on the tongue from the heavy burger is best matched by a decadent Mocha Float (P189) which is served in a mason jar full of iced mocha, topped with ice cream, whip cream, and assorted candy. This dessert drink will stuff your heart and your tummy with happiness. And then there are those days when you and your friends all feel exhausted but deserve to be pampered with some sinful delights. If that’s the case, the Bagnet at Chicharon Bulaklak (P335) is here to the rescue. 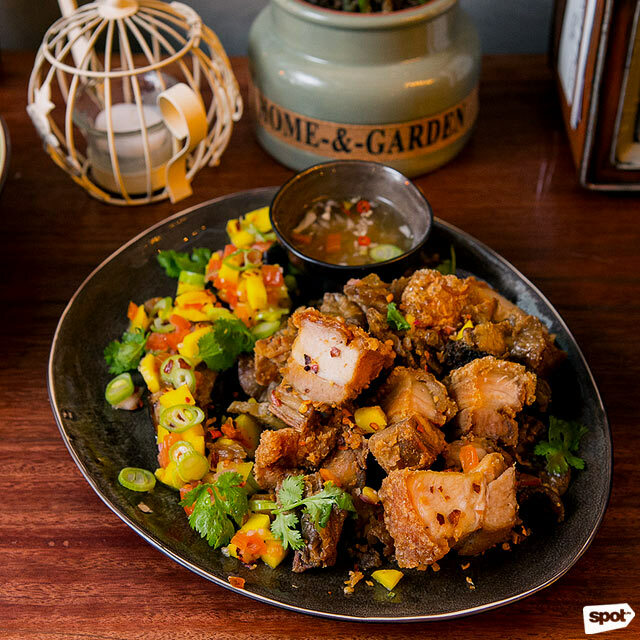 Munch on deep fried pork belly and crunchy chicharon bulaklak with a delectable sourness of fried talong ensalada with mango bits, and pinakurat vinegar. Feel free to carbo load this meaty viand together with the pineapple fried rice. 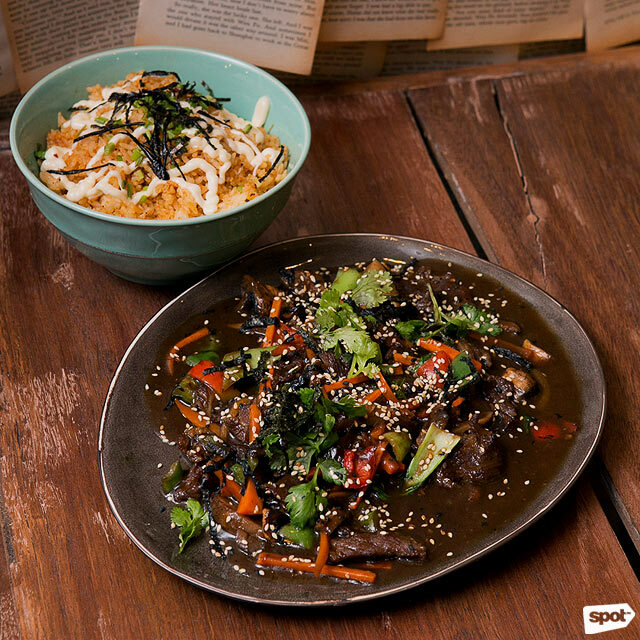 If your group wants to share something less sinful, a good option would be the Mongolian Beef Salpicao (P329), marinated beef cuts fried in savory Mongolian sauce served with Asian vegetables in kimchi rice. If you’re a “saucy” kind of person, you can completely drench your rice with this overwhelming large dish of delight and relish the succulence in your mouth. 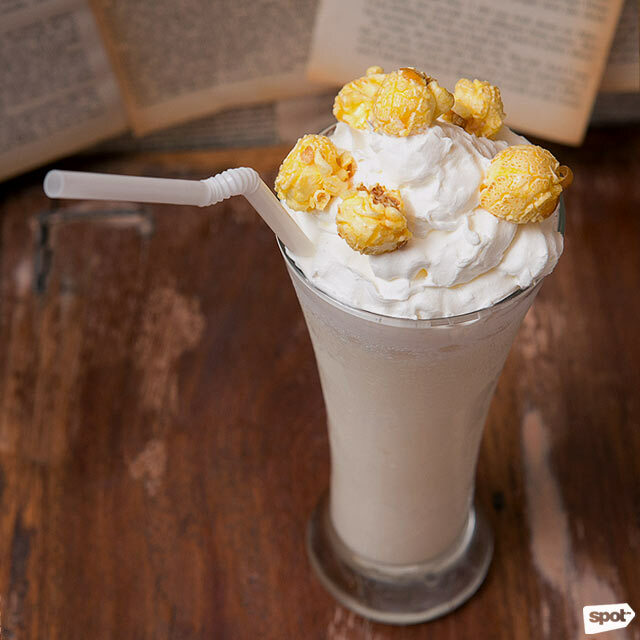 Speaking of succulent, that is just about the right adjective to describe the Butterscotch Popcorn Smoothie (P175) a new addition to the menu. This ingenious creation has blended popcorn, a smothering of whipped cream, and a drizzle of caramel popcorn. It’s like a butterscotch brownie melted and chilled to a liquid state of mind-blowing yumminess that brings you to an unchartered new experience! There’s nothing that hits the spot like real comfort food you can rely on, such as the Asian Fried Chicken Adobo (P250/single, P375/half, P625/whole). 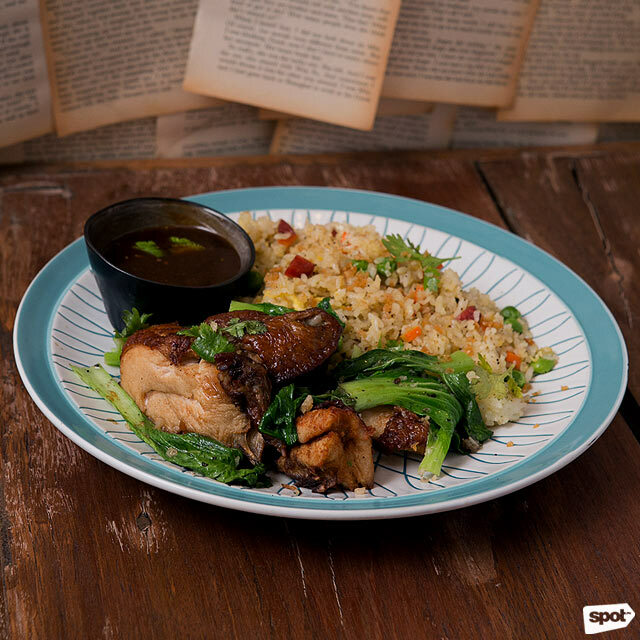 This tasty adobo is prepared with margarine yang chow fried rice, steamed garlic bok choy, and roast chicken liver sauce. 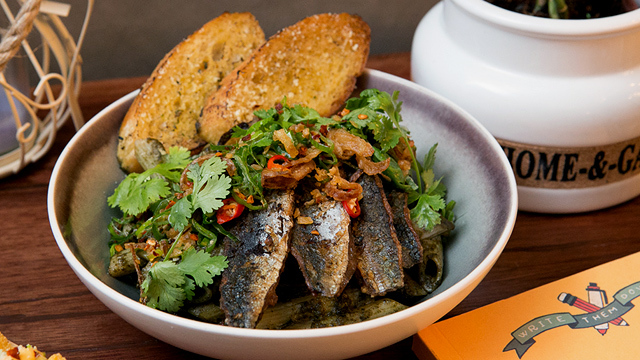 This dish just happens to be a favorite of owner Jessica herself. The Flat-Tops S’mores (P90) could easily become a crowd favorite. 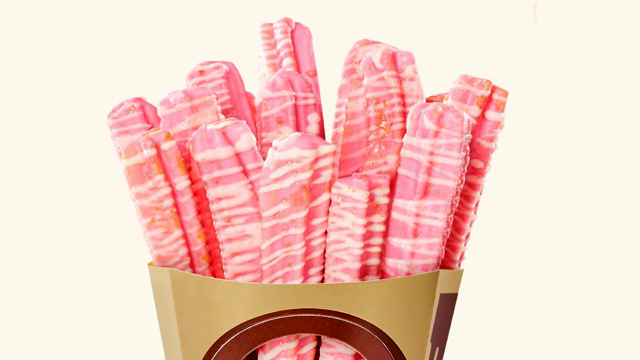 Every bite would remind you of childhood—especially if you liked bingeing on marshmallows, brownies, and Flat Tops! 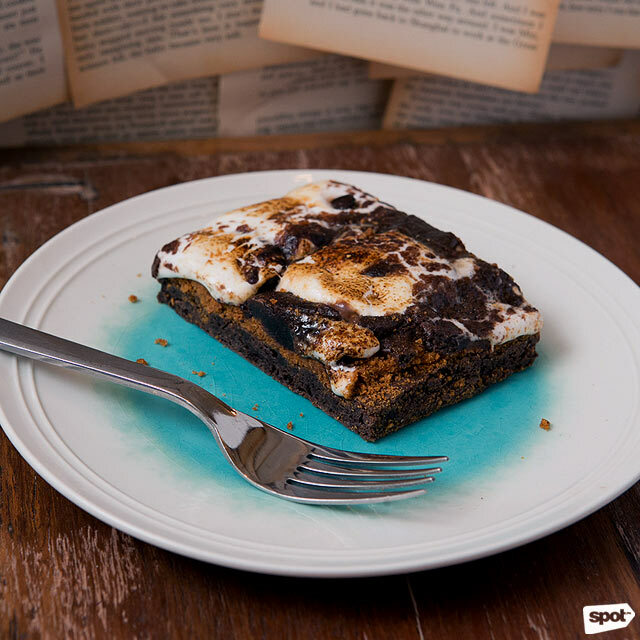 This treat lands on your plate nice and hot with melted marshmallow, crushed graham, fudgy brownie chocolate, and one whole Flat Top chocolate inserted inside this divine goodness. 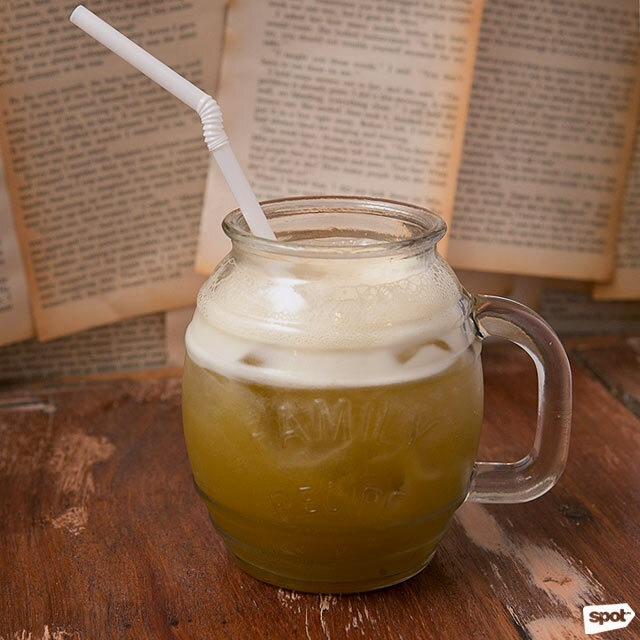 Of course not everyone has a sweet-tooth, so if you want to cool it down sans the decadence of sugar, try the House Tanglad (P99/glass, P259/pitcher), a splendid homebrewed fresh lemongrass tea stirred with mint, pandan, and a hint of ginger, surely the perfect conclusion to a long week or just the cup you need to start a new day. 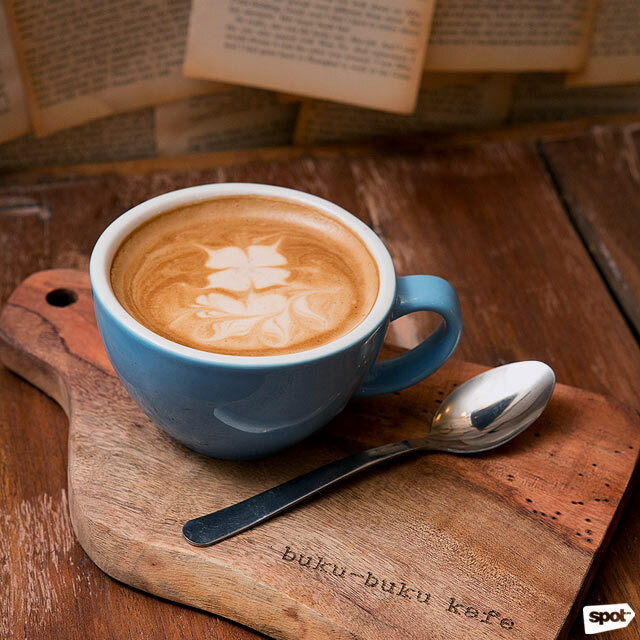 Regardless of what time it is, Buku-Buku Kafe is always alive with the celebration of creativity, as there are activities such as calligraphy classes, photography seminars, art lectures, and the like. 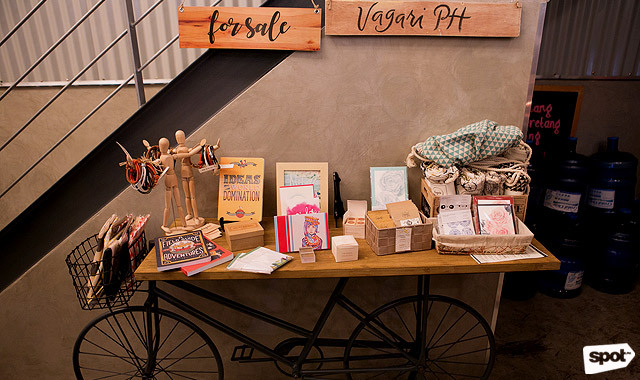 At the ground floor, you will find a carefully curated space where young local independent artists can display and sell their crafts—from postcard prints, zines, bags, and trinkets. No space is left idle to the senses. The café promises to offer unique yet responsibly created and sourced food along with the vision of always challenging the norm, taking the simplest form of space and transforming it into something spectacular.